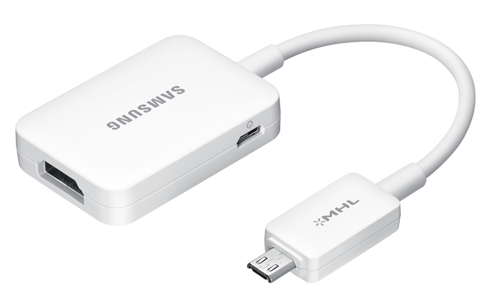 I've been receiving emails asking me how to connect the Samsung Galaxy S3 to a TV set with HDMI since the standard or universal MHL-to-HDMI cable won't work. This issue has been going on for a couple of years now and only a small percentage of Galaxy S3 owners actually knew the phone has a different configuration. Samsung changed the configuration of its flagship phones starting with the Galaxy S3. Unlike the S2, which requires a 5-pin connection, the Galaxy S3 uses an adapter with 11-pin connector, which needs to be bought separately. Of course, Samsung sells the accessory. Refer to the picture below for its actual appearance. Connect one end of the HDMI cable to the HDMI port on your TV and the other end to the port on Samsung HDMI Universal Adapter. Connect the charger to the charging port on the adapter and plug it in to a power source. Connect the microUSB connector of the adapter to the Power/Accessory Interface port on your Samsung Galaxy S3. Set your TV to stream feed from the HDMI port where you plugged the cable. Your TV should now start streaming what's on your phone's display but remember DRM-protected contents will not be displayed. I hope this works for you. Otherwise, my mailbox is always open to your questions. Feel free to contact me at harold@droidista.com and I may include your problem in the next publication.